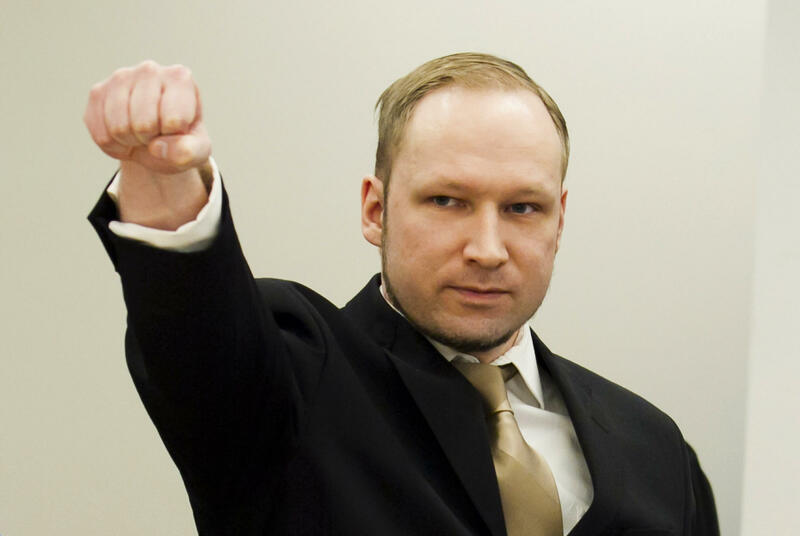 Norwegian mass killer Anders Behring Breivik gestures as he arrives for his terrorism and murder trial in a courtroom in Oslo April 16, 2012. Norwegians watching news out of Charleston, South Carolina are reminded of another mass shooting four years ago. And they knew exactly what to call it. On July 22, 2011, after Anders Behring Breivik detonated a fertilizer bomb in front of a government building in Oslo, he gunned down scores of young people at a political summer camp on nearby Utøya island. Newspaper columnist Helene Skjeggestad was reminded of the attack when she saw social media about the Charleston church shooting. Skjeggestad notes that in the United States, the tragic event is being called a hate crime and the act of a lone wolf. In her column in Olso's Aftenposten newspaper, she says many Americans seem to be missing what's obvious to her. "For us it's strange that American media are not calling Dylann Roof a terrorist." She says this tweet summarizes what's wrong with initial US reaction to the killings. Skjeggestad says that following the Oslo attacks in 2011, her newsroom had to decide how to characterize the attacker. "Of course we discussed Breivik being a 'lone wolf' just as it's being discussed with Dylann Roof," she says. "But I clearly remember us calling Breivik a terrorist right away, because it was so clearly politically motivated." Skjeggestad says "In US law, and in Norwegian law, the perpetrator's motive determines whether an act is a terrorist act. The perpetrator must have the motive to create fear in all or part of, the population." She is unequivocal in her assessment that the Charleston church killings were political, and that suspect Roof was intent on terrorizing. "His actions are motivated by race, and he's clearly trying to create fear in a bigger part of the population."